Thanks to Brynne Williamson, PP, PLS for taking the time to answer The Paralegal Mentor's Thirteen Questions! Brynne is a Paralegal with Helzell Fetterman, LLP. in Seattle, WA where she specializes in estate planning, probate and taxation. She is a graduate of the paralegal program at San Joaquin College of Law in Clovis. CA. What has been the highlight of her career? What advice does she have for new paralegals? How has professional association membership benefitted her? 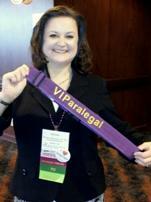 What does she see as trends in the paralegal profession? Find out below. Thanks, Brynne! 1. Tell us about your job. I am a paralegal with Helzell Fetterman, LLP in Seattle, WA. My job focuses on estate planning, probate and taxation. 4. What professional associations do you belong to? I am a member of NALS...the association for legal professionals. I am mid-way through my term as NALS Marketing Director and am a member of the NALS Think Tank. I love the work that we do on the board and with the “Tank” and really enjoy being a part of the governing process. 6. What has been the highlight of your career? Serving as the 2008-09 NALS of Greater Seattle President was a great honor for me. It was a very exciting year, and I am proud of everything that our board of directors accomplished. In addition to our regularly scheduled Noontime Seminars and evening membership meetings, we also organized a Meet & Greet social and two full-day CLE programs. That year we also launched an electronic newsletter and were honored to win the NALS Foundation Jett Award, 2010 Founders Award, for one of its new features, "Where's Eula Mae." 7. What do you see as hot trends in the paralegal industry? Paralegal regulation continues to be a hot topic. I'm sure your readers have varying views; however, whether you are for regulation or not, I think you should keep yourself informed and self-regulate. The legal field is dynamic and to be a good paralegal, you need to attend CLEs that pertain to your area of law and that help you grow as a professional. 8. If someone contemplating a paralegal career asked you for career advice, what would your answer be? My advice would be the same as my grandfather's was to me years ago: if you are determined and work hard, you can accomplish anything you set your mind to. And always, always remember that you will play an important role in your law firm and may be the person who has the most contact with your clients, so you should represent yourself professionally and positively. 10. You've enjoyed a successful paralegal career. To what single event or person do you attribute that success? I would never be where I am today without the support of my significant other, George. Although I know he would like to sometimes talk about something other than NALS or what I learned in the office that day, he has been there by my side from the beginning and is always willing to help me with my projects and give me advice. 11. What is the most important step a paralegal can take to keep his or her career interesting? Join your local paralegal organization. It is the best way to stay ahead of the trends in the legal field and to network with other legal professionals. 12. What time in the morning do you first check your email? As soon as I wake up – bright and early at 5:15 am. 13.What was your first job? My first job was working for the Bashful Butler, a catering company owned by my friends' uncle. We were the official caterers for the Tournament of Roses, and in addition to the big party at the Rose Bowl on New Year's Day, we catered all of the float construction events in the air conditioned 'float barns.' I'll never forget how cold those nights were, but the job had some good perks, like cake every weekend! Bonus Question: What’s your favorite food? I’m not sure if it counts as “food,” but I love candy! Last October at NALS11 in Cincinnati, my roommate Renee Kleinjan, introduced me to my new favorite concoction: candy corn mixed with dry roasted peanuts. Yum!